This post is brought to you by freelance travel writer, Rebecca, in partnership with OctopusTravel.com. If you’re wondering what to do in Dublin, whether you’re a backpacker, a flashpacker or just simply on a weekend away – this great little guide should point you in the right direction. 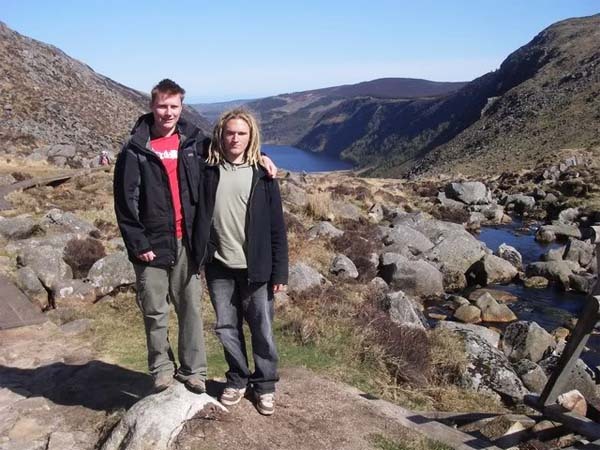 I haven’t been to Dublin since I was 18 on my first backpacking trip through Europe, now I want to get back there and do it again! Read on for some fun things to do in Dublin! For such a compact city, Dublin packs quite a punch. History-lovers can explore the ancient city walls and Dublin Castle, and cultural nomads can soak up fresh knowledge at the National Museum of Ireland or Dublin Writers Museum. Lively backpackers would never make it out of the city if they tried to drink in every pub in the Temple Bar area, and for travellers with a sense of adventure the Dublin Mountains are just a stone’s throw away. From historic landmarks to gleaming modern architecture, and traditional pubs to trendy Docklands developments, Dublin offers a compelling mix of old and new, while the countryside and outdoor adventure is never far away. It’s easy to find hotels in Dublin to suit most budgets, and of course there are also many hostels and other affordable mid range guesthouses – although accommodation gets booked up well in advance around St Patrick’s Day (17th March), when Dublin holds a superb festival, so plan ahead if your trip coincides with this. Temple Bar - credit to flickr user Cristian Ghe. The medieval, cobblestoned Temple Bar area has to be the first stop on any backpacker’s itinerary, because it’s full of atmosphere – and great pubs. 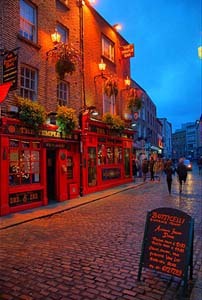 The Irish really know how to have a good ‘craic’ and there’s nowhere better to experience this than in Temple Bar. Then there’s the Norman City Walls and historic Dublin Castle to explore, as well as Trinity College, Ireland’s oldest university. The National Gallery and National Museum of Ireland are also in the city centre, while a little north is the Dublin Writers Museum, showcasing first editions and memorabilia from famous Irish writers. Don’t miss the transformed Docklands area of the city, either, or the strikingly modern Grand Canal Theatre. In such a compact area, you’ll stumble across most of the main sights without any effort, but for more off-beat activities visit the National Wax Museum or take a trip up Chief O’Neill’s Chimney Viewing Tower in Smithfield, which offers excellent views over Dublin. You could also go outdoor go-karting or paintballing at Kart City, about 15 minutes by road from the city centre, but for genuine outdoor adventures you’ll need to head out to the Dublin Mountains. This region is incredibly accessible to backpackers thanks to regular buses from Dublin city centre in just 30 minutes. Various local outdoor companies offer orienteering, fishing, rafting and horse riding activities, but if you just want to go hiking and enjoy the fresh air, you can go it alone. Pick up a copy of the “Dublin Mountains” map from a book shop (about 9 euros), or in the reception room of your Dublin hotel, and you’ll soon discover the incredible Dublin Mountains Way, which includes interesting heritage sites such as the historic Hell Fire Club hunting lodge and the remains of Lord Massy’s Killakee Estate. I dug up some old photos (found them in an old PhotoBucket account) from my last trip to Dublin. It's a friend and I enjoying the Dublin outdoors. If you have time head for Cruagh Mountain for views over Dublin on a clear day; Tibradden Wood for birdwatching; or Kilmashogue for its bronze age megalithic tomb. And after a hard day’s hike, cycle ride or horse trek, seek out one of the area’s famous Irish pubs such as the Blue Light in Carnaculla or Johnnie Fox’s in Glencullen, and sink a pint of Guinness while you soak up some live music and enjoy the craic! 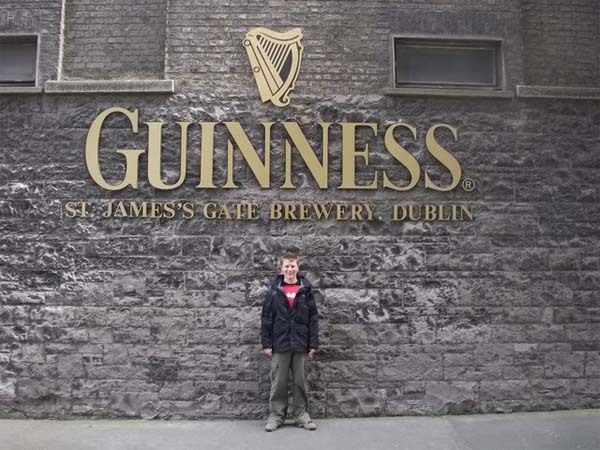 Here is 18 year old me with the Guiness Brewery sign. I think we were on such a budget at the time we couldn't actually afford to go in and do the tour. We were there in 2011 and loved it so much we’re heading there again this October. Walking around, we got a kick out of walking around McConnell Street and seeing street performers and artists, then finding a Leprechaun museum was fun. Also, Guinness lovers should definitely go to the Guinness Storehouse. It’s one of those must-do things in Dublin and worth the price of admission.